What is the one category of reward credit cards making inroads on Travel Reward cards? Cash back. Over the past few years we have seen an explosion in the cash back cards being offered by card issuers in Canada and two more are now in the market. Today American Express officially launches the SimplyCash and SimplyCash Preferred Credit Cards. American Express already has had a cash back card in their portfolio, the American Express Gold Cash Back card but that was a charge card in which you can't run a balance and technically have no spending limit but it does appear that card has once again been pulled for new applications. They alos offer the True Earnings Card from Costco which is technically a cash back card as well. 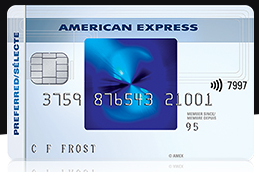 American Express has obviously watched this space closely and done their research to ensure that when they introduced these new cash back cards to the market they would challenge the mainstays in this space the mbna Smart Cash MasterCards and Scotia Momentum Visas. Both the Amex cards have stronger base earning rates than any other cash back cards on the market although at certain spend rates some other cards do match or exceed these cards (see our Cash Back comparison chart for more details but overall these cards should earn more cash back on overall spending in the category. If you are heavy purchaser at Grocery, Gas and Drug Store the mbna and Scotia cards do have higher earn rates but you'll have to evaluate you overall spend to see which cards can earn you the most cash back. When applying for and receiving the cards, the SimplyCash Preferred Card's introductory offer of 5% cash back on all spending for the first six months matches the MBNA SmartCash card for Grocery and Gas but exceeds it since that bonus is for all spending. The no fee SimplyCash also matches that 5% on Gas and Grocery but also adds in the restaurant category. The majority of cash back cards in Canada do not carry an annual but there are several that do including the Scotia Momentum cards and as such the higher end SimplyCash Preferred does as well but at $79 per year Amex has priced it lower than the Infinite version of the Momentum card. The basic SimplyCash card matches the majority of cards with no annual fee. Both cards come with decent insurance benefits especially the Preferred Card. The insurance/benefits offering on the Preferred Card is stronger than both the Scotiabank Momentum Visa Infinite Card and the mbna Smart Cash World MasterCard while pretty much matching the similarly priced CIBC Dividend Visa Infinite. Despite having no fee, the SimplyCash card also offers several insurance benefits that keep it equal to or better than other top no fee cash back cards. In a nutshell it is nice to see American Express come out with competitive cards in the fastest growing segment of the rewards credit card industry. In some ways I believe their relaunch of the Gold Cash back card may have floundered and spawned or at least spurred greater attention to these new cards and how they could be more competitive in this market segment. Both cards deserve a serious look if you are in the market for a new card. If travel rewards aren't your thing then the SimplyCash Preferred makes a great option to be a primary card since it does have many travel related benefits for when you do travel. For those of you who are travel rewards oriented but are considering a cash back card as your secondary or tertiary card either of these new Amex cards could fit the bill. To learn more about the SimplyCash or SimplyCash Preferred Cards please visits www.amex.ca/simplycash. We'd love to hear your thoughts on this latest offering from American Express! Leave us a comment below or connect with us Facebook or Twitter!